Play and practice like the pros! Nerfoop is the ultimate basketball experience. 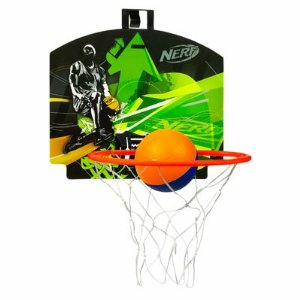 Thanks to a stylin' backboard, tough hoop, net, and super-cool Nerf basketball, you can shoot and slam dunk like your favorite players. And since it's Nerf, you can play just about anywhere. Simply hook the slick, oversized backboard to a door, and you've got game! Hoop measures about 9 1/2-inches in diameter. Backboard style subject to change. Ages 4 and up. Please Note! Backboard graphics may vary.